Terry Morris was born at Ft. Worth, Texas on March 6, 1956, the youngest son in the family of six children of Iouise and Laverne Morris. Terry grew up near the Greenwood community north of Decatur, Texas. Early in life, Terry exhibited an unusual talent. He gave his first public performance at the age of two-singing "Cotton Fields Back Home" at a school program in Ft. Worth. This led to playing the mandolin and guitar; mostly dance type music. His brother, Dale, became interested in the fiddle when Terry was about seven, and would sometimes take Terry along to contests. Terry never got to play much, but he soon realized WHY! It was because he could not play! At the time, it was hard to swallow, so he concentrated on the guitar-becoming very proficient. He was made aware of the difference between fiddling and "sawing"-when he heard Benny Thomasson playing at a jam session. His first competition was at a contest at Grosebeck, Texas in May, 1972. 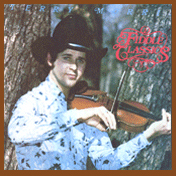 He did not win, but his ability was very apparent-so much so-that Velda Fryer implored him to come to Hallettsville in 1973 and play at the Texas State Championship Fiddlers' Frolics. Terry thought she was making fun of him! Within a period of less than two years, Terry had reached the pinnacle of success. He spent his entire time traveling around the state; staying with his many fiddle friends and absorbing everything possible that would contribute to an improved style of Texas fiddling, having masters as teachers, he grew up with the finest music in the world. His untimely death on September 7, 1988, at the age of thirty-two years left a void that will never be filled. He left a legacy to his son TONY JOE MORRIS of the Ft. Worth area.